Guest post by Andrew Glikson (Andrew is an Earth and paleo-climate scientist, Australian National University who contributes regularly to Brave New Climate). That global climate change has reached an impasse whereby the “powers-to-be” are entertaining climate geoengineering mitigation, instead of the urgent deep reduction of carbon emissions required by science, represents the ultimate moral bankruptcy of institutions and a failure of democracy. With global atmospheric CO2 levels rising at about 2 ppm/year toward 388 ppm, or near-440 ppm CO2-e (including methane effects), John Holdren, in his first interview since being appointed as Obama’s new science adviser, revealed in an interview with AP (8 April, 09) “global warming is so dire, the Obama administration is discussing radical technologies to cool Earth’s air” which “as an experimental measure would only be used as a last resort … It’s got to be looked at … We don’t have the luxury of taking any approach off the table … One such extreme option includes shooting pollution particles into the upper atmosphere to reflect the sun’s rays“. Holdren compared the way humanity is facing dangerous climate change to passengers in a car with bad brakes heading toward a cliff in a fog, saying “The sensible passengers will certainly say: ‘Let’s put on the brakes, even if we don’t know it will save us. It may be too late. We don’t know exactly where the cliff is. . . . Let’s get on with it.’ “. Holdren is not alone in considering geoengineering. The National Academy of Science is also looking at the subject in its new multidiscipline climate challenges program. The American Meteorological Society is preparing a statement on geoengineering, stating “it is prudent to consider geoengineering’s potential, to understand its limits and to avoid rash deployment.”.The British parliament has discussed the idea. (1) Increased reflectivity (albedo) of the atmosphere, injecting sulphur dioxide (suggested by Paul Crutzen, the Nobel Prize winning atmospheric chemist), or alumina particles, or even installing reflectors in space. The effects of sulphur injections would simulate volcanic events, such as of Pinatubo (1991) or Tambora (1816), which resulted in cooling of the Earth surface by about 0.5 degrees. At best, albedo enhancement represents a short term band aid solution to the fundamental greenhouse problem, and will not be able to prevent ocean acidification. (2) Increased sequestration of CO2 in the oceans, enhancing algal blooms and phytoplankton photosynthesis through fertilization with iron filings, or constructing vertical pipe systems designed to enhance oceanic circulation and CO2 intake from the atmosphere. (3) Biochar burial and soil enrichment. Combustion of plant waste under low oxygen conditions and burial as charcoal, removing carbon from atmospheric circulation and enhancing plant growth and photosynthesis, as well as soil enrichment. A major controversy erupted with objections to Biochar by George Monbiot, involving James Lovelock and James Hansen. (4) Chemical sequestration involving combination of CO2 with sodium hydroxide (NaOH) installed in pipe systems (“Sodium trees”), followed by separation and burial of CO2, costed at about $US300 a ton. A back-of-the-envelope calculation suggests the reduction of atmospheric CO2 by 50 ppm would cost about $US 10 — 15 trillion (although mass production may lessen the cost, as well as contribute to employment), less than 10 times the global military expenditure in 2007. First, due to the cumulative nature of atmospheric CO2, neither 5/15% nor 25/40% emission reduction by 2020 relative to 2000 would be able to prevent major climate change. This is because CO2 levels, now at 387 ppm and rising by 2 ppm/year, will exceed 400 ppm by 2020, well into the high danger zone. Assuming CO2 emissions are reduced by even 40% relative to 2000, it would keep rising by a minimum of 1.2 ppm/year reaching levels near or above 450 ppm by 2050, and this is without even accounting for the effects of methane, likely reduced CO2 intake by the oceans and increase in positive feedbacks from the biosphere. At 450 ppm, with lag effects, polar ice sheets undergo advanced melting, with consequent major sea level rise. It is not clear how many of the submissions made to the Australian Senate Inquiry into the CPRS take account of this factor. Second, it is a good question whether even such feeble CPRS attempts would not be squashed by the all powerful fossil fuel lobby, currently supporting a massive well-funded disinformation campaign, including claims that the Earth is “cooling”, accusing scientists and environmentalists of “environmental thuggery“, including threats such as by Republican congress woman Michelle Bachmann (“I want people in Minnesota armed and dangerous on this issue of the energy tax because we need to fight back. Thomas Jefferson told us” adding “The science is on our side on this one“. Third, The preoccupation of suburbia international with economic issues. Until people fully understand the implications of runaway climate change, government actions are likely to be restricted within the context of the virtual reality of economic boom-bust bubbles, where greed and fear obscure the physical realities of the environment and of agricultural food production, a consequence of over 60 years of commercial propaganda rendering populations victims of ruthless vested interests at the expense of future generations. The Wilkins ice shelf collapse is but the latest symptom of fast-melting polar ice. Last year was the first during which the huge (13,680 square kilometers) shelf, which bridges the West Antarctic Peninsula with the Charcot and Latady islands, developed fractures during mid-winter. Now Advanced Synthetic Aperture Radar (ASAR) images acquired on 2 April 2009, by the European Earth Observation (ESA’s) Envisat satellite, confirm the ice shelf is collapsing into thousands of ice bergs, removing the barrier for the flow of continental glaciers into the ocean. Climate geoengineering is fiercely feared and resisted by many scientists and environmentalists, due to the collateral damage and side effects, and as it would take pressure of the carbon polluters. Moreover, that the powers-to-be reached an impasse with CPRS schemes suggests to many a moral bankruptcy of institutions and a failure of democracy. It is likely only a combination of deep urgent cuts in carbon emissions, coupled with major investments in fast-tracked development of a wide range of effective carbon dioxide draw-down methods may be capable of making the difference. In Glikson’s “at least four principal categories”, the fourth, capture of atmospheric CO2 as carbonates, has a significant omission: the use of alkaline earth silicate minerals to do this capture. This can and does happen outdoors. Based on M2SiO4 going only to (2 MCO3 + SiO2), I figured here that the electricity yielded years earlier when a coal-fired power station putting a given quantity of CO2 into the air, divided by eight, would suffice to pulverize, and lift 5 km, enough forsterite to take that CO2 down. The particles’ weathering lifetime, which is the time they take to do their CO2 sequestration, was about one year. Serpentinite (weathered peridotite derived from forsterite-dominated ultramafic rocks) displays extensive carbonate (magnesite) crusts and veins in exposures, representing reactions with ground water. Pulverized serpentinite would be altered accordingly, although I wonder whether the pace of the reaction would be enough to remove significant CO2 from ground water and the atmosphere? The energy required for extensive pulverization of serpentinite would need to come from solar or other alternative source, as the use of fossil fuel would cancel any benefit. … the use of fossil fuel would cancel any benefit. That turns out not to be true, hence my “divided by eight” remark. I’ve observed both biochar and serpentine weathering close up and I consider them to be dead ends. Biochar enthusiasts typically remove timber from forests, half burn it then spread the charcoal on paddocks, all the time using diesel powered machinery. They go into raptures over the carbon buildup in the paddock but seem blind to the carbon loss in the forest or the use of diesel. A disused open cut mine at Adamsfield near home shows carbonate veins in the weathered serpentine. The mine was for platinum group elements. This is a very slow process which I doubt could be sped up with a net CO2 advantage. We want these supposed carbon sinks to excuse our fossil fuel burning so we tend to exaggerate their effects. It’s like reckless driving because you think you have insurance only to find the policy expired. [alkaline earth silicate weathering] is a very slow process which I doubt could be sped up with a net CO2 advantage. Emphasis mine. My calculations are in the linked Realclimate thread; your “doubt” need not remain innumerate. That is a “we” that does not include me. I’m working up figures for turning algae into biochar; looks doable on a massive scale. The biochar could be sequestered, a form of “geo-engineering”, or simply sold the coal users as a replacement fuel for fossil coal, the costs are such that one ought to be able to slightly undercut the fossil coal price with an altogether superior fuel. The latter is a form of mitigation. First, reduce all present CO2 emissions(not just 40%), the ocean will still keep absorbing considerable CO2 due to ocean sea-bed CaCO3 dissociation into bicarbonate, chemical weathering will still absorb CO2. Most of these schemes are “hair-brained” distractions from replacing coal burning with nuclear and renewable energy. Bio-char is the only sequestration scheme that could be scaled to remove significant CO2, but I don’t think it can compete with sea-bed CaCO3 dissociation. Neil, Would not “sea floor carbonate dissociation”, which I assume would occur under lowered pH conditions, release CO2 into water rather than sequester CO2 (from the atmosphere?) Please elaborate. The chemistry is fairly simple but easy to come to the wrong conclusion. Sea water contains cations Na(+), Ca(++) etc and anions Cl(-), etc, including carbonate CO3(–) in equilibrium with bicarbonate HCO3(-) and H3O(+)hydrogen ion. At the pH of the ocean(7.9) most CO2 is in the form of dissolved gas or HCO3(-) ion and a small amount of CO3(–) ions. A new CO2 molecule combines with one CO3(–) and one water to give two molecules of HCO3(-). In the deep ocean at pH7.9 CaCO3 in sea creatures shells lying on the ocean floor dissolves to give CO3(–) ions each of which can combine with a new CO2 molecule to give 2 molecules of HCO3(-).If you drop limestone or coral into a strong acid, the HCO3(-) ion is not stable and is converted to CO2 and water. Presently in shallower warmer water, CaCO3 doesn’t dissolve, but will begin to soon if the pH goes much lower. Presently when coral precipitates CaCO3 it takes one carbonate ion out of solution but that means the ocean becomes more acid and is less able to chemically combine with CO2. The confusion is because CO2 can be in solution as CO2 gas(unstable as in soft drinks), as a bicarbonate or carbonate ion(stable) or precipitated as CaCO3. Can the ‘Sodium Trees’ be integrated with wind turbine towers? What puzzles me most about biochar (or black charcoal to give it less-sexed-up name) is why would one produce a prime quality biofuel and then bury it when a tonne of charcoal could be used to replace a tonne of fossil fuel. Doesn’t really make much sense. The other aspect of charcoal is that its decay time in a soil profile depends heavily on the soil properties. Anoxic tropical sols may very well preserve charcoal but what little info I’ve been able to find suggests that its half-life in arid-zone soils, in particular, is short. A review by Dominic Woolf titled “Biochar as a soil amendment” available by Google search is a recommended read for a more scientific consideration of the subject. Of course the only way we can stop wrecking the planet for our descendants is to stop burning fossil fuels. No other way can offer any long-term reliable solution to the problem. I see the advantage of charcoal is that it can be produced where plants grow, and sequestered in the same location, giving soil benefits, reducing transport costs. Many Australian soils have charcoal thousands of years old, sometimes 50% of carbon. Biochar production as distinct from traditional charcoal production also produces bio-gas that could be used for local cooking or running engines. Interesting reply Neil. Whilst I’m aware of cores from lakes, both salt and fresh, containing very old charcoal, I haven’t heard of soils with 50% carbon. Can you tell me where these soils are found? But on biochar as a CO2 removal method. Consider that to have a major effect on lowering CO2, the amount of carbon removed each year must be of the order of say over 1 billion tons. If we spread a layer of charcoal 1m deep each year, then, using a density of 208 kg/cu.m, that has covered an area that is 70 km square or about athe area of greater Sydney. Next year we do the same and the year after, etc. And for your scenario we’re growing plants on the top of the pile each year. What I’m trying to say here is that to solve the CO2 problem requires really big solutions because the problem is measured in billions of tons of CO2 each year. Take a look at the size of the diggers, trucks, coal wagons and ships that move coal and to remove that carbon from the atmosphere you will need an industry of the same magnitude. Far far easier not to put it there in the first place. Pyrolysis gases contain nasties like tars and carbon monoxide and don’t store well. Let them run vehicles and chainsaws on it to complete the loop. As somebody said maybe its better to use charcoal as a cleaner fuel (eg as briquettes) rather than bury it. I suggest that charcoal enthusiasts have to go ever further afield to get fresh wood supplies, not quite as locally as claimed. Their conclusions are based on sites that already have good soil and rainfall and may not be valid elsewhere. They also waste a lot of heat. Some related claims are just implausible eg repeat firing of NT savannah sequesters more carbon than doing nothing. Sorry for the miss-understanding, soils with 50% of the carbon content as charcoal, actually only 0.1-1% carbon. Carbon 14 dating shows some is very old. Need to stop burning fossil fuels the equivalent of 7–8 GtC per year. Alternatively, deeply bury biochar to that amount, or replace fossil coal with biochar in some fraction. Similarly, replace fossil fuel diesel with biodiesel and so on. To do this rapidly will require, as much as possible, using algae for fast growth. In slow pyrolysis, the evolved gases are immediately burnt to provide the necessary process heat. About 20% of the biomass is so consumed; the remainder is about half pyrolysis oil (about half the heating vlaue of #2 heating oil) and half biochar, about 96% carbon. “To be sure, some of Australia’s climatologists assert that such extreme events are a normal part of the country’s diabolical weather. Australia is the driest inhabited continent on earth and is accustomed to long periods of dry weather and dangerous fires. What does it exactly mean: “Nor has any link been offered between global temperature trends and the meteorology of Victorian heat waves.”? Is the above ‘Andrew’ the same Andrew who wrote the original post, including the words below? That global climate change has reached an impasse whereby the “powers-to-be” [sic] are entertaining climate geoengineering mitigation, instead of the urgent deep reduction of carbon emissions required by science, represents the ultimate moral bankruptcy of institutions and a failure of democracy. Does he agree that leading with this paragraph tends to decide on science’s behalf what it shall require — “urgent deep reductions of emissions”, presumably of gross emissions, not net ones — rather than letting it decide for itself, as I think I have done by actually doing the arithmetic on alkaline earth silicate pulverization and dispersal? When scientists tell us about the brilliant processes they’ve designed to fix up some mess we’ve made, cane toads come to mind. But I also think of another story. A few years back a bodybuilder, Momo Benaziza, collapsed and died after a competition. You see, he’d been taking steroids to build his muscles. The problem is that while testosterone boosts growth hormone, thus growing muscles, it also makes you retain water. Which means you’re not as “ripped” as you need to be for a competition. So he took diuretics to make him lose water. Of course, if you lose water you also lose natural body salts, and can faint. So he took some salts. The salts built up in his bloodstream and broke the natural balance of sodium and potassium which our cells need to be able to pass messages to each-other. His muscles stopped working – including his heart muscle. Good-night, Gracie. He began by misusing drugs to alter his body chemistry, and tried to balance things, which led to more problems which he tried to balance and… it killed him. He could just have stopped taking steroids. So when scientists tell us, “don’t worry if burning stuff has led to an imbalanced climate system, we can do other things to balance it out!” I’m sceptical. Momo Benaziza played with his body’s complex chemistry when he didn’t really understand it very well. The planet’s climate is even more complex than the human body, and less well-understood. I think it’d be a lot easier and less risky to just stop burning stuff. Good example, but to extend the analogy, climate scientists are saying “Stop hitting the steroids immediately, and take these salts until your water balance is restored. There is a risk of complications from the salts as a result of the chronic steroid abuse, but without them you’ll probably die anyway, so it’s likely to be a risk worth taking”. Not really a good analogy, because once you’ve got cancer your body can’t fix up the imbalance; whereas if we stopped emissions today, there’s a bit of momentum still in the system but things would be dampened out and reach an equilibrium with lower CO2 ppm than today. Also, since chemotherapy works by poisoning and almost killing the patient, it’s perhaps not an analogy you’d want to use, not a good way to sell the idea. Some scientists may be saying that, but it’s a question of emphasis. The whole greenwashing thing has shown us that people are desperately grasping at anything which shows the faintest hope of letting us, well, just keep on truckin’ and munchin’ on those burgers. Logically, if these measures can balance out the carbon we’ve already pumped into the system, why can’t they be used to balance out any new carbon we put in? If algal blooms and biochar and limestone and all the rest work so brilliantly, why not go crazy with them and we can burn coal until it runs out? (c) the years or decades testing these methods, even if they turn out to be perfect, will be used to create more emissions, since these methods will be an excuse for not changing. That seems falsely to suggest that perfection is required. “All the rest” encapsulates the one method that has tested itself. Why do you not give it the proportional attention it is due, ‘Kiashu’? The reflectors in space thing seems overly optimistic. I have to admit that despite being a long time SciFi fan I’m a bit prejudiced against the proponents of space based solutions – reflectors or orbital solar power – as I suspect too many of them see large scale space capability itself as the primary goal and they’ll hitch their wagon or space capsule to anything going that way. Some seem to take Earth’s ruin as inevitable and only by colonising space will our future as a species be assured whereas I tend to think that space is so inhospitable as to make places like Antarctica, the Sahara and the high Andes look downright idyllic and I don’t see a great rush to colonise those places. Space based solutions to climate change and clean energy need to show clearly that they are cost effective and can be effective in a timely manner. Neither looks likely. Space based reflectors still leaves ocean acidification unaddressed and I don’t know how cheaply such reflectors can truly be made – given light pressure is able to shift substantial satellites out of their orbits, I presume any reflectors will need guidance and propulsion systems. There would be no placing them and expecting them to stay where they are put. But I admit to some curiosity as to the suitability of the power transmission technologies proposed for space based solar as a backbone for a global grid. I don’t think CCS on coal plants has a real future – the volumes of CO2 are enormous, far greater than the amount of coal to produce them and it’s much harder to store and transport – coal can be carried in open trucks but CO2 can’t. Ocean fertilisation may not work that well – Ove at climateshift had a post recently on experiments with it – which saw the extra CO2 absorbed go into the food chain rather than sink and be “sequestered” on the ocean bottom. Biochar – as pointed out above – is potentially a biofuel; producing it and burying it whilst still digging up and burning coal seems counterproductive. Enhanced weathering seems on the face of it to have less downsides, but it, like the others, is going to be used as an excuse to not seriously act on emissions. Even the most feeble of reasons will do to justify failing to act and it isn’t only the corporate vested interests at work; people like the apparent wealth that modern consumer society provides and rarely look to downsides or long term negative consequences. Out of sight is out of mind, GHG’s are invisible and global warming is difficult to understand, hard to believe and people like Plimer actively work to convince people it should be disbelieved. Chu and others have just popularised white roofs and roads. 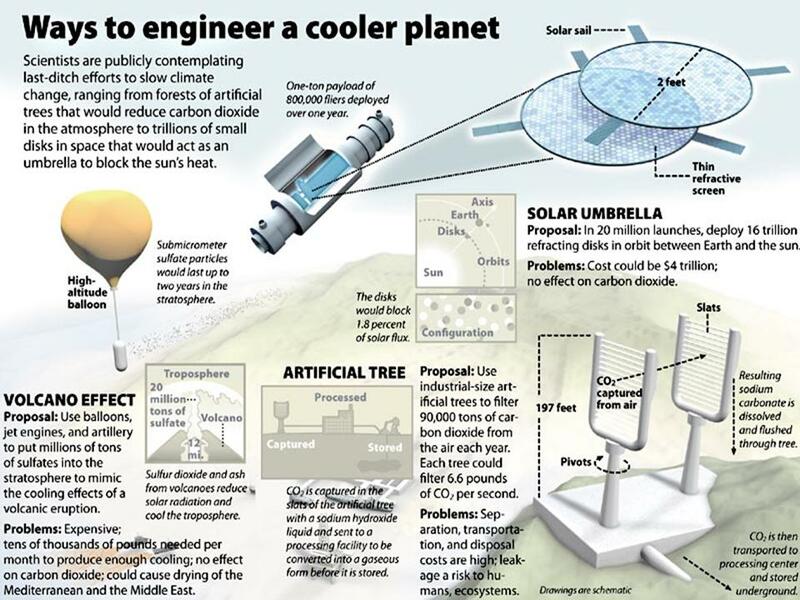 These may be a technically practical geoengineering solution. The numbers are impressive – $1,100 billion equivalent of emissions mitigation – some links are here White is the new Green. The world is a great place, but it is falling apart and we all are responsable for this. Be responsable now and try to make it better. The Biochar Revolution is exactly what it says !